* : Plus Shipping. Shipping is Free when ordered with a Breast Pump. What A Cool idea!! The Breast Milk Cooler Set is great as an extra set for bringing to work or school to store pumped breastmilk or for leaving at daycare with your baby. 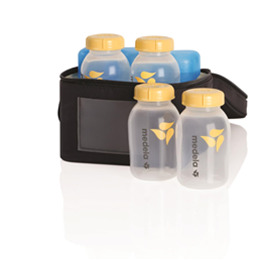 The contoured cooling element is designed specifically for your Medela 5 oz.breastmilk bottles.